DEBORAH CROMBIE: Okay, it's Tuesday, we have a long week ahead of us, and I think we need a little excitement. As in VROOM VROOM, get your blood pressure up and your heart racing excitement. All it takes for me is this first line from my buddy Tammy Kaehler! If you haven't read Tammy's books featuring Kate Reilly, race car driver, you are in for a big treat. Tammy has gotten close to her character in a way that most writers only dream about, and this year she has totally topped it. She's got a job at--Well, I'll let Tammy tell you. Crap, I think. That’s one of my drivers. I’m already screwing up my job! I’ve had a lot of opportunities over the last dozen years that other people would sell organs to experience. Like sitting down with hall-of-fame racing drivers to learn how to drive certain tracks—and finding out who pees in the seat of the race car and who doesn’t (yeah, it’s a thing). Like getting a ride around a race circuit from Mario Andretti. Like swapping book recommendations with a woman who drives 230 mph. Like sporting an all-access credential—the kind money can’t even buy—for the Indy 500 last year. But my story gets better. The 2016 race wasn’t just any Indy 500, it was the 100th running of the iconic motor race, and the place was overflowing. With something approaching 350,000 people. (Seriously.) They said one of every 1,000 people in the United States last May 29 was at Indianapolis Motor Speedway. They said IMS represented the 30-somethingth largest city in the country that day. It was packed. But wait, my story still gets better. I wasn’t just attending the race. 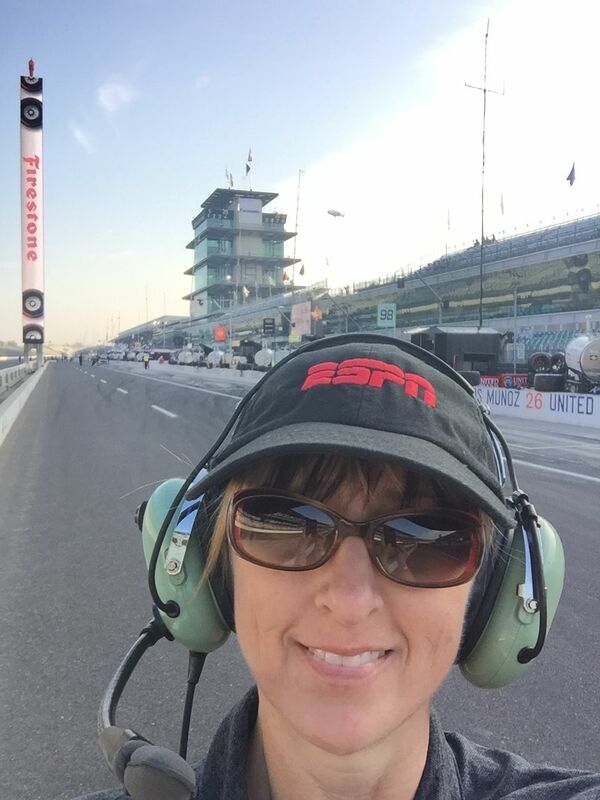 I was in pit lane—working for ESPN. And I was terrified I would do something wrong. 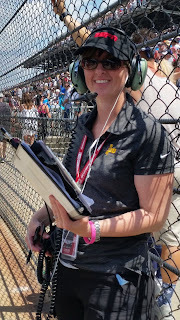 My job was to be a backup pit spotter—a representative of the network broadcasting the race who monitors a certain set of pit spaces, teams, cars, and drivers. In my case, I had the last dozen cars in the 33-car field. The top twenty were covered by other pit spotters, plus on-air talent and cameras. My cars/drivers were those least likely to have hot stories, so I didn’t have talent or camera. Just me and my nerves. I wandered up and down my portion of pit lane throughout the race, collecting information about pit stops, problems, changes made to cars, and so forth. Once, I legged it to a particular pit to get an answer Patsy and her on-air guy needed. Occasionally, I reported when a top-20 running car of mine was headed for a pit stop. Mostly, I sweated and worried. And had an absolute ball. BE IN THIS MOMENT! I kept reminding myself. ENJOY THIS, RIGHT NOW! And I did. I’m aware just how rarefied the air is I get to breathe. I mean, who gets to work the pits for the Indy 500?! What’s more astonishing—or worse, if you’re one of those people who’d climb over my twitching corpse to take my spot—is that growing up, I didn’t know a thing about the Indy 500. Or racing at all. I was working for a mortgage company that started sponsoring racing, and I went along to the races because they needed help. That was the start of my insider access…and the start of Kate Reilly. I started in a smaller, less well-known series. With less-known teams and drivers. As I’ve written more books and done more research, I’ve met more and more people. One person led to another, who led to another, and suddenly, I know a woman who races in the Indy 500. 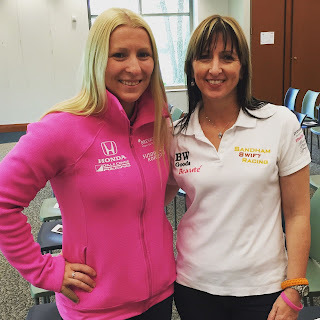 In fact, Pippa Mann not only races in the Indy 500, but she’s also a reader! (She’s my unicorn, basically.) She enthusiastically became my primary source for KISS THE BRICKS, set at the Indy 500. Just as suddenly, when I needed access last year to research the new book, it turns out I knew the right people who were willing to recommend me for the job in the pits. And the best part of this story? They recommended me again for this year. So come Sunday, May 28, when The Greatest Spectacle in Racing, the Indy 500, takes the green flag again, think of me. I’ll be the one stressing, sweating, and grinning ear-to-ear in the pits. DEBS: I'd never have thought someone could turn this die-hard horse racing fan into a car racing fan, but Tammy did just that with her first Kate Reilly book. She makes you feel what it's like to be in the seat of the little, fragile metal shell, careening around the track at nearly warp speed. And there's a cracking good mystery to make it even better. After the first practice session for the legendary Indianapolis 500 motor race, Kate Reilly is stunned to discover she was the fastest driver—but she’s more surprised to learn she wasn’t the first woman to top the speed charts in the race’s 106-year history. That feat was accomplished in 1987 by PJ Rodriguez—who shocked everyone by committing suicide ten days later. When the press, bloggers, and social media go crazy over the connection, Kate loses her identity—suddenly everyone’s comparing Kate and PJ, calling Kate PJ, and wondering if Kate will kill herself, too. Except that PJ’s family claim PJ was murdered, and they want Kate’s help finding her killer and restoring her reputation. Thirty years after the fact. In the days leading up to the iconic race, Kate takes to the track for practice sessions, fulfills sponsor obligations, promotes the race for the IndyCar series, and plays peacemaker between the warring sides of her family. She also digs into PJ’s experience in the Indy 500 paddock and uncovers pervasive prejudice and chauvinism—then and now. With investigative help from “Special Team Kate,” she’s on the trail of potential suspects for PJ’s murder…and then one of them turns up dead. Kate prepares to run the biggest race of her life at the same time as she narrows down the clues to two murders, all while fighting for her voice and identity in the storm of media attention. But will the past stay buried or will history repeat itself and leave Kate fighting for her own life? 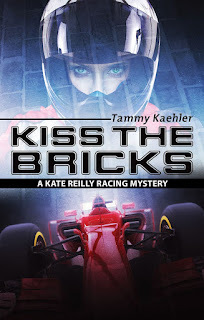 Meg Gardiner says, "Smooth, quick, and punchy, KISS THE BRICKS pulls readers into the high-octane drama of the Indianapolis 500. The racing feels authentic and intense, but what propels this novel is the compelling mystery," and I agree. Here's more about Tammy: When Tammy Kaehler discovered the racing world, she was hooked by the contrast between its top-dollar, high-drama competition, and friendly, family atmosphere. 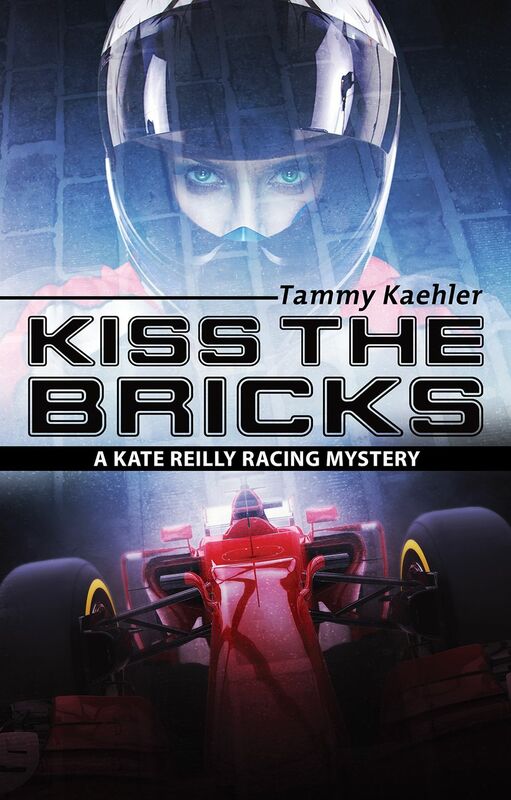 Mystery fans and racing insiders alike have praised her award-winning Kate Reilly Mystery Series (Dead Man’s Switch, Braking Points, Avoidable Contact, and Red Flags), and Tammy takes readers back behind the wheel in her fifth entry, Kiss The Bricks. She works as a freelance writer in Southern California, where she lives with her husband and many cars. Find out more: www.tammykaehler.com. DEBS: I love the title of this book, and the cover is fabulous! Tammy, do you have input on the cover? So tell us if you are racing fans, REDS and readers. Have you been to the Indy? It sounds amazing, and I want to hear more! Wow, Tammy, what an exciting adventure! Your enthusiasm for racing certainly makes your stories stand-out spectacular. No, Debs, I’ve never been to the Indy . . . the thought of being in that crowd is rather daunting . . . but Tammy certainly makes it sound like the experience of a lifetime. I wonder, Tammy, what is your most memorable racing experience? Never been to Indy but saw a lot of the Riverside Raceway in college. It was nearby the school and was a popular diversion, although for me it was more a way of meeting other students. Back then I much preferred the local demolition derby in Bakersfield. No, I don't drive a normal car nor have I ever watched the Indy 500. But I have seen the Honda Indy race in Toronto a few times. Very loud and exciting to watch. TAMMY: I have enjoyed reading about Kate's previous races in different parts of the world. Love the title of the newest Kate book! And it's great that you got to be the backup pit spotter at the Indy. I lived in Indiana for five years and never even went near the track! But how fun that you got to be on the track, Tammy, and get to do it again this year. That's awesome. Best of luck with the new book - I love the premise. Hi, Tammy - your amazing experience reads like a novel! Life as a high-octane page turner. Congratulations on the new book! I confess, I'm not a fan of car racing. It's not really a New England thing. And it's loud. Still, what a rush! Tammy tell us about your title... Kiss the Bricks? Wow! So fabulous. I love the Indy 500, it is , exciting, beautiful, suspenseful… I've been a couple of times and I have to say it was glorious. I can't get through memorial day without watching it on TV now, even the sound of it makes me nostalgic. It is the only car race I am even barely interested in… But I'm an Indy girl. And so funny-- In my first job in radio, in 1970 :-) they did not allow women in the pits! !i was about to be one of the first to be allowed to cover the race from there, but I moved to Washington DC instead. I have never wanted to be at a car race - but this interview makes it sound pretty exciting. Congrats on the new book! How exciting for you! Tammy, I met you at Left Coast Crime in Phoenix and got your first book. Have not picked it up to read yet, but I surely will very soon. My area of the world, Austin, TX, has the Circuit of the Americas - Formula 1 racetrack. Now, I know nothing about racing at all, nor have I been interested. However, my husband loves it. He's going to get to drive a car on that track soon and is so excited about it. I'll tell him that you'll be in the Indy 500 this year. Look forward to diving into your series! Hank, you coulda made history! Hi, Tammy! So pleased for your success, and for the amazing special access you've had to the race. I've been to the time trials, but never to the actual race. That was in the mid-70's. Cincinnati is only two hours from Indy, so a lot of folks from here go on day trips. Even that was thrilling. There's a reason they make adult diapers, just saying. And I have a horrible suspicion what kiss the bricks might mean. Tammy, I love the premise of this book. Is there a story behind the story? What an amazing experience, Tammy! I have to ask: What kind of a driver are you? Has your research impacted the way you put the pedal to the metal? I had a dear friend, a transplanted Englishwoman, who developed a taste for racing in her eighties. You can imaging my surprise when she told me. I was still, after fifty years of frinedship, getting used to serving her tea in a cup and saucer. I lived in Belmont Shore in the 80s and 90s, and Shoreline Drive was part of my route to work, so I have some fond and some not so fond memories of the Long Beach Grand Prix. Not to mention the making of "Speed." Now I live a couple of hours from Watkins Glen, and racing is a big event here in the summertime. You are very brave and dedicated to hang out in the pits. Sounds terrifying, and I would certainly be inclined to accidental urination, seeing those cars coming toward me. Joan: my most memorable racing experience? Good question, as there have been a few. I'd say it's a tossup between the Indy 500 last year (the SPECTACLE!) and getting a ride around the Long Beach Grand Prix track in a two-seater car with Mario Andretti at the wheel. Hi, Reine, Grade, and Edith! I'm always surprised at how "normal" people (book people, not racing people) I meet have some brush with racing. It's more of us in society than you'd think. Hank, I didn't know that story about your opportunity to report at the race! I did meet the first woman to do so: Denise McCluggage, who also raced in her free time. She's the inspiration for one of my characters in this book, in fact. Mary: Being at a race—at least one the size of this one—is a heck of a show. I recommend it at least once for the experience of having your mind blown, if nothing else. Kay: I've really got to get to the new COTA track! I hope your husband has a great time driving it! Karen: You'd think adult diapers, right? But no. I think it's that they don't plan to have to pee, but sometimes it happens. If all else fails Tammy, you are having one heck of an adventure! I see you are up against some of what I faced writing golf mysteries--people thinking they hate the sport so won't enjoy the books. But you are a great ambassador and I suspect you win over a ton of readers! Congrats! Hallie asked about the title. It's got a bit of a double meaning, as all of mine do, with both a racing and real-world implication. To start with, as Karen in Ohio may have guessed, it refers to PJ Rodriguez (the racer from 30 years ago in the book) who fell to her death from the top of a building. But mostly, it refers to a tradition at the Indianapolis Motor Speedway. OK, Deb asked about the story behind the story. I was at a library book panel three years ago, and a woman approached me afterwards to tell me about a family friend named Cheryl Glass, who'd been the first African American woman to try to qualify for the Indy 500. Cheryl was effectively the first African American woman to be a professional driver, and from everything I looked up about her later, she was quite a talented woman: talent behind the wheel, talent as a clothing designer, a good student, and more. Though later in life, she had some domestic issues and other challenges. But what struck me was this: the woman I met said that some years after her Indy 500 attempt (Cheryl didn't qualify or run the race), Cheryl committed suicide—but her family thought it was murder. That's when the hair stood up on my arms. And that's who turned into PJ Rodriguez in my book. What's great is that mixing some chapters from 1987 in with the present-day main portion of the book really helped me get at the history of the race in a new way. And it was fun to also tell someone else's story, even if it was a bit more tragic. Ingrid, good question! I live in Los Angeles, so I'm fast and decisive on the freeway. However, I'm no racer. I went to racing school, because I needed to, and it was simultaneously the coolest and most terrifying thing I've ever done! I'm a chicken behind the wheel, when it comes to pushing the limits. But I do think that my knowledge of racing (and that bit of training) has made me better able to react appropriately to problems. I hope! Finta, your friend sounds amazing! Good for her. Paul Newman raced well into his 80s, so it is done. I'm in Bixby Knolls in Long Beach, so I get all the fun of the race coming to town without the noise and traffic problems! Also, I should be clear: in the pits, there's a three-foot concrete wall, plus a whole lot of pit equipment between me and the speeding cars! Hi Roberta! Yep, you know the challenge of a niche topic. But I know that I like to learn about hobbies and jobs and industries that I otherwise know nothing about, so I keep hoping other readers will do the same. Plus, it's really about the characters, right?! Oh, I love a good cold case murder mystery - this sounds fantastic! I can't wait to read Kate's latest adventure. Some of my earliest childhood memories are of listening to the Indy 500 on the radio. It's the only race my parents paid attention to and usually once a year we went to the local racetrack where it's still in the family lore that I could stretch out on the bleachers and fall asleep (I was nine!) to the sound of the cars whizzing by. Our local track was the Waterford Speedbowl (CT), which NASCAR just terminated its relationship with because the owner was busted for human trafficking - there might be a story in that for you, Tammy. I remember you being in the pits last year! SO exciting! Can't wait to watch you in action again this year. I know you'll be busy but can we follow you on Twitter of FB for inside updates on your view of the race? I'm not a fan of racing, but I get what an opportunity that is for you. Huge congrats, and definitely enjoy that moment! Seriously, though, don't you love that moment when you hear a story like yours about the woman driver who committed suicide (or didn't) and you just know you have to write about it? Those are the things you can't predict but they are such blessings for a writer. And hi Jenn! Yes, I'll do my best to chronicle my adventures in the pits on FB or Twitter, at least leading up to and after the race. During it, I'll be too frantic to post! And oh, yes...going to look up the Waterford Speedbowl story now. Wow, Tammy! Talk about gaining experience and doing research for your books. You definitely have the inside track on that (hehehe, pun intended). I have to admit to not being a race car fan, but that doesn't stop me from now being interested in your series. I love to read about areas outside my comfort and interest zone, and when it's a woman in a male-dominated field, it's got to be interesting. So, congratulations on your success with this series, and I look forward to reading my first one soon. Omigosh. I am so jealous. Riding with Mario Andretti. Here in Houston A.J. Foyt is a favorite son. My only car racing watching experience was when I was about 10 or son. There was a stock car track adjacent to the now long-gone amusement park, Playland. My dad took big brother and me and our next door neighbor to watch a race. I was probably looking the opposite way, yearning for a roller coaster ride. We went only once because a week or so later a spectator was killed when a tire came flying off the track and hit him. Dad decided it was too risky. I've seen blurbs popping up all week about Kiss the Bricks. I think it's a must read. Kathy, I'm with you. I love stories about women succeeding against the odds and learning new stuff. I think you'd like my books! Pat D, I've seen A.J. around the pits and paddock, and by all accounts, he's a HOOT. What a character! And I'm sure glad that racing has gotten so much safer for everyone, including the spectators. Hope you like the book, thanks! Hooray for James Ziskin and Ellie Stone! Will I See You at the Reunion? ABOUT A DOG is Out Today or How Did I Get Here? How old is your paprika? Would You Visit Another Time? In Search of Times Past.